WOODLAWN — At the Shrine of Christ the King on Woodlawn Avenue, the roof is unfinished and the heat and electricity are inconsistent. The backup furnace is so noisy, it has to be turned off during Sunday Mass so people can hear. "There are Sundays you dip your hands into the holy ice," said the Rev. Michael Stein. In its former life as St. Clara and later St. Gelasius, the shrine at 6415 S. Woodlawn Ave. was a bustling place of worship for the Carmelites, the Catholic order that founded the parish in 1920 and also started Mount Carmel High School. The church fell into disrepair and was slated for demolition until the community rallied to save it. The Archdiocese of Chicago reversed the planned demolition in 2003 and ushered in a $7.3 million renovation and resurrection under the Institute of Christ the King. As the long process of restoring the building continues, the shrine is inviting the community to return for a concert series aimed at reviving some of Woodlawn's cultural life and raising funds for the renovation. 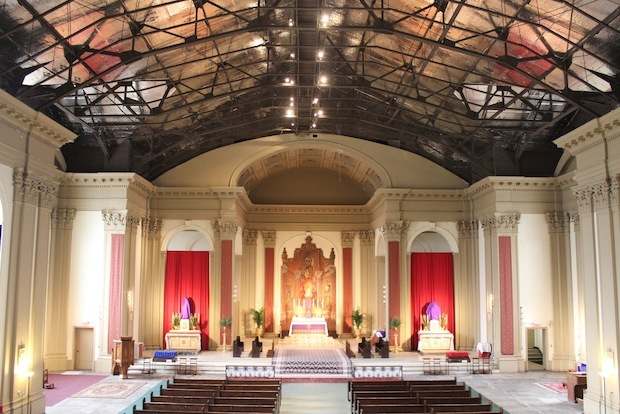 After Lent ends with the Easter holiday, the shrine will welcome back the Amadeus Consort on May 4 and June 8 for two concerts, welcoming neighbors into the building they helped get landmarked in 2004. "That’s part of being a shrine, there is a much larger cultural life,” said Stein, who was assigned to rebuild the congregation and the church in 2007 after building churches in Africa. "The idea is to bring people the beauty of music,” said the Rev. Matthew Talarico, standing on the cracked concrete slab floor that was once girded in marble. The warped floor now needs to be replaced. "This church is like a cultural center,” Talarico said. Talarico is among the three priests dispatched to restore the shrine as a place of pilgrimage for Catholics. The original parish had declined with the neighborhood around it in the decades after World War II and was crippled by a fire in 1976. By 2001, the church had not held services in several years and the Carmelites moved out most of the iconography in preparation for the expected demolition. "It's hard to say we started from scratch — we were starting with less than nothing, we were starting with a ruin," Stein said, adding that it took three years of clean up before services could be held in the sanctuary again in 2008. Now, among other issues, the ceiling needs to be replaced — the congregation can literally look up through the rafters and see new insulation on the underside of the roof. The priests are still a long way from thinking about a planned altar with the infant Jesus surrounded by golden rays of light and topped with a gilded crown. But they are well beyond the rubble that once littered the sanctuary and have solidified a foundation for the shrine. The church now boasts a congregation of 200. "We always refer to the parishioners as the living stones of the church," Talarico said. "So we had to get those living stones back first."